The Cavy Grazer kitchen is ideal for larger C&C Cages where you have a larger guinea pig population or you want to use more kitchen area for a loose hay pile either in addition to a hay rack/container or in place of one. The larger size gives more room for a big hay pile on top of disposable bedding. While you can use fleece in the kitchens, they are designed to be used with disposable bedding. With a generous 2x2 grid area, the Grazer would take up half of a Large 2x4 grid cage or a third of a Jumbo 2x6 grid cage. When used in combination with the Cavy Canopy and Backsplash, it creates a cave-like private area giving guinea pigs a sense of security which, in turn, encourages its use. See the Kitchen Suite. The Grazer should only be used in 2x4-grid sized cages or larger. The Grazer kitchen is fastened with ratcheting rivets to hold the flaps in place. Front wall: 2.5" height and finished with your choice of black or white edger. 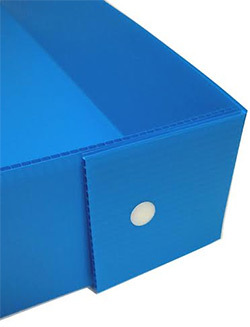 4mm Coroplast 26" x 27" x 4.5" walls in your choice of 16 colors!